Resthaven Community Services in Mount Gambier supports older people who live in their own homes, offering a little support with domestic tasks, laundry, shopping and social outings through to high level Home Care Packages. Resthaven offers a wide range of flexible services so that you are able to live independently at home. Support is delivered in your home by trained Resthaven home support workers, or at one of our Community Services sites near you. You may choose to receive support with household tasks, home maintenance, shopping, social activities, keeping healthy, personal care and nursing care. Resthaven Community Services are located across the metropolitan area, and the Adelaide Hills, Murraylands, Riverland, Limestone Coast, the Fleurieu, and Gawler and surrounds. and we’ll facilitate your referral through My Aged Care. Advocacy and support to find or maintain secure and affordable housing, and link with support services is available for older or prematurely aged people from all backgrounds who are on a low income and are homeless, or may be at risk of becoming homeless. It is also available in the Murraylands, Riverland and the Limestone Coast. For a fun and low impact way, join one of Resthaven Community Services’ exercise and wellness groups. With services offered at a community services site near you, you are sure to benefit from our individually tailored programs, and make new friends, too. Some of our services are listed below. To find out more, call Resthaven on 1300 136 633. We’ll facilitate your My Aged Care or ACAT referral. To find a service near you, click here to go to the ‘Find a Service’ page. Used for both rehabilitation and gentle exercise, this class helps to strengthen muscles, improve movement, and ease aches and pains. Falls prevention classes focus on strength and movement, showing you how to fall-proof yourself and your home. Keep fit, socialise and have fun at one of our exercise classes, focusing on strengthening muscles and improving joint movement. Perfect for those with low mobility, relax and take a chi ball or tai chi class! Improve posture, concentration, and reduce aches and pains. Our massage therapy is delivered by qualified physiotherapists to help relieve aches and pains. 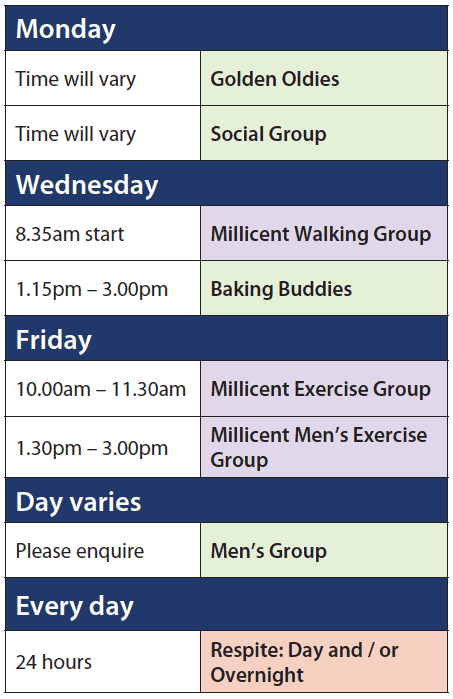 Our activity groups are tailored to your interests. Come along and join in painting, knitting, games, outings or something that you suggest! Resthaven offers fun social groups in a variety of settings to suit all lifestyles. Click here for more information. Physical and emotional support for people with Parkinson’s Disease. Click here for more information. Interested? Call Resthaven on 1300 136 633 to find out more. Resthaven’s Health and Wellness Groups help you maintain your physical and mental health, to remain living at home and leading an independent lifestyle. Some Health and Wellness groups target specific chronic diseases, which help you manage symptoms, and improve your quality of life. To help you stay living at home longer, Resthaven’s Home Care Packages provide in-home assistance and support. Services are delivered using a Consumer Directed Care (CDC) approach, giving you choice and flexibility in the way you receive your services. Resthaven’s trained staff deliver services in a way that supports and respects your choices, independence, and privacy, providing peace of mind. There are four levels of Home Care Packages. Home Care Level 1 and 2: designed to help people with basic or low level care needs. Home Care Levels 3 and 4: designed for people with intermediate or high care needs. House cleaning, laundry, shopping and paying bills, and help with pets. Grooming, showering, assistance with medication, and continence management. Help with preparation of healthy home cooked meals. Physiotherapy, speech pathology, occupational therapy. All services are delivered based on assessed needs, and are responsive to the client’s cultural background, lifestyle choices and preferences. 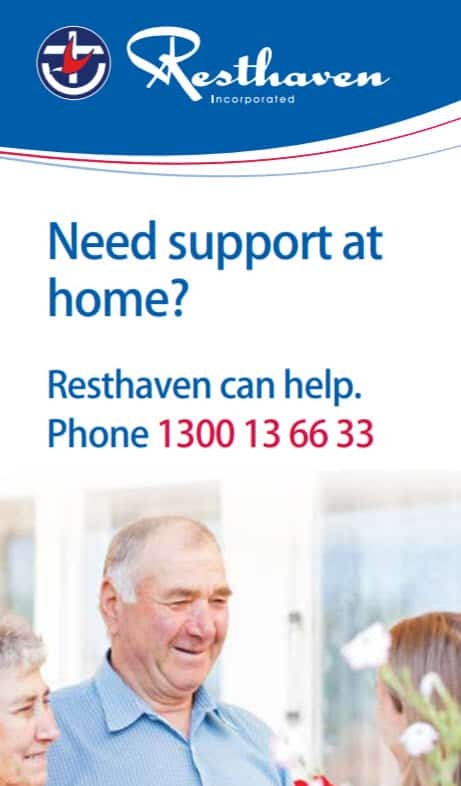 Resthaven’s Home Support Services provide in-home assistance to help you stay living at home. We assist you in self-care, supporting you in maintaining your independence. Resthaven’s nursing services aim to improve the quality of life for older people living in the community or residential care. We provide rehabilitation, transitional care, and clinical nursing and allied health services for people living at home. Dementia care. Resthaven’s Professional Nursing services provide dementia-focused clinical care. Palliative Care. Resthaven supports people whose illness or chronic condition cannot be cured. Click here to download the Resthaven Community Nursing brochure. We provide respite to support carers, to enable them to sustain their physical and emotional health. Respite can be in the carer’s or client’s home, a community venue or at one of our Community Services centres or respite cottages. Choose from day respite, group respite, and overnight respite. Click here to learn more about Respite, and how Resthaven supports carers. Resthaven’s Short Term Restorative Care (STRC) Program provides services over an eight week period to improve your wellbeing and independence. The services aim to improve your ability to complete everyday tasks, and delay or avoid the need for long-term care. Resthaven’s Community Services run social groups in an area near you! Come join us for an outing, activities, or just a cup of tea and a chat. Contact Resthaven Community Services on 1300 136 633 for more information. Our social groups have a great time! We regularly travel around Adelaide, always seeing and doing something new. We work with you to develop activities based on your interests, hobbies and abilities. To find a service near you call 1300 136 633, or click here to go to the ‘Find a Service’ page. Day Respite provides respite for the carer so they can take a break from their caring role and continue to participate in community life, while having the confidence that the person they care for is supported by trained staff. Staff are trained in supporting older people and their carers living with dementia. Respite groups can be involved in many different activities, tailored to the client. All Respite groups include morning tea and lunch. Resthaven actively runs support programs for people living with dementia. These programs are funded by the Commonwealth Home Support Programme (CHSP), and offer both individual and group activities for people over 65 years living with memory loss, with or without an identified carer. These tailored programs provide a supportive environment that aim to reduce isolation, strengthen community and social supports, promote wellness and independence, and provide memory support through Cognitive Stimulation Therapy and Brain Training. These programs support people living in southern and eastern metropolitan Adelaide. The Parkinson’s Disease Support Groups support people and their carers who are suffering from Parkinson’s Disease with both physical and emotional support. Groups are currently run from Resthaven Paradise and Eastern Community Services, and Resthaven Murray Bridge, Hills, and Fleurieu Community Services (Murray Bridge). The groups undertake balance activities using the Chi Ball, games, education and cognitive speech exercises each week, with regular outings. Resthaven’s Speech Communication Group supports older people recovering from stroke, surgery or injury that has affected their speech, resulting in aphasia or other problems. Resthaven is an approved provider contracted to deliver Veterans’ support services on behalf of the Department of Veterans’ Affairs (DVA). Contact the DVA on 133 254 or 1800 555 254 (toll free for country callers) to determine your eligibility. Veterans’ Home Care Low level home support as determined by DVA assessment. Download the DVA’s Veterans’ Home Care Factsheet. Veterans’ Community Nursing Provides clinical nursing and/or personal care services to eligible veterans and war widows or widowers in their own home. – Download the DVA’s Community Nursing Factsheet. Do you feel overwhelmed in your caring role?